Over 8,000 volunteers showed their love on May 5 for the seventh annual I Love My Park Day! 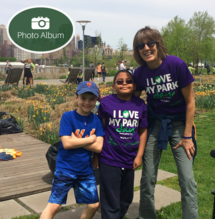 Organized in partnership with Parks & Trails New York, it was the largest I Love My Park Day ever, with over 135 state parks, historic sites and public lands participating. Volunteers took part in hundreds of projects, including raking, weeding, cleaning up litter, building picnic tables, removing invasive species, marking trails and planting trees and flowers. The efforts of the many volunteers demonstrate just how important parks and historic sites are to families and communities throughout the state as places to be active, explore the outdoors and relax with family and friends. It is our honor to work every day to ensure that all state parks are open and accessible for all to visit, but we could not do it without you—the volunteers and friends who work not just on I Love My Park Day but year-round to make our parks and sites the very best they can be. On behalf of everyone at the New York State Office of Parks, Recreation and Historic Preservation, thank you for inspiring us with your boundless spirit of community and service. I Love My Park Day 2018 Photo Album. From the Long Island coastline, to the gorges of the Finger Lakes to the mountains of Allegany, new options for vacation lodging abound at State Parks this summer. For the first time State Parks on Long Island will offer vacation cottages. Ten cottages at Wildwood State Park on Long Island Sound will feature both one-and-two-bedroom units, as well as a bathroom, kitchenette, screened porch and furnishings. Heckscher State Park on the Great South Bay will soon offer one-bedroom units and two-bedroom with a loft options. Each of the 15 units will feature a kitchenette, bathroom and screened porch furnished with sleep sofa, dining set, and Adirondack chairs. 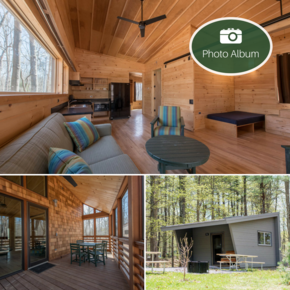 In the Finger Lakes, nestled amongst the region's wineries, gorges, and cultural destinations, 14 new cabins opened at Buttermilk Falls State Park. The just-the-basics cabins provide one double bed, triple bunk bed and comfortable shelter in inclement weather. Seven 1930s-era cabins at Robert Treman State Park are also restored with modern updates. Each unit offers electric service, heat, and custom hardwood beds milled with wood from storm-damaged park trees. Ten historic cabins on Ryan Trail in Allegany State Park received major exterior renovations last year with the help of HistoriCorps a not-for-profit building preservation organization that trains volunteers to restore historic structures, along with Alfred State College students. Park tradespersons improved the cabin interiors, including installing wood-burning fireplace inserts. This much-needed work will ensure that these historic cabins built in the 1930s are around for decades to come. Photo Album: New Cottages & Cabins Photos. In conjunction with National Get Outdoors Day, New York State Parks and the state Department of Environmental Conservation (DEC) are hosting a special Outdoors Day on Saturday, June 9, at select locations across New York to encourage people to participate in outdoor activities and recreation. Visitors will be able to develop new skills and learn more about fishing, paddling, hiking, biking, bird watching, and more. This series of family-friendly events will run from 10:00am-3:00pm at 30 locations, with a variety of guided programs, self-guided tours, and demonstrations scheduled at specific times. Activities are free, but there will be the normal admission fee at State Park facilities. For a full list of events visit: dec.ny.gov Outdoors Day Events. 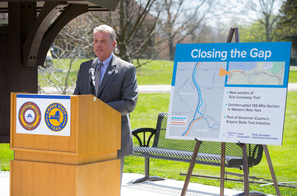 Construction has begun on new recreational trail projects across the state to expand and connect New York’s long-distance trail network. On Long Island, the Jones Beach segment of the Ocean Parkway multiuse path is under construction for a 2.5-mile extension from the end of the Boardwalk to the West End 2 Building. This extension will permit path users to travel the full length of the park, for a total of six miles of trail. In Western New York, work to convert the West River Parkway into an 8-mile multi-use trail will create a new route along the Niagara River. The project will transform two lanes of highway into a vehicle-free trail between Beaver Island to Buckhorn State Parks ultimately connecting Buffalo to Niagara Falls. Construction is also underway on a new 2.1-mile section of trail in Niagara County running from Tonawanda Creek Road to Feigle/Fisk Road. It will link up with four miles completed in 2015 in Lockport, providing for an uninterrupted 135-mile stretch from Buffalo to Lyons. In the Mohawk Valley, nearly five miles of new paved trail between South Amsterdam and Pattersonville will follow the path of a former railroad line. The project helps close a gap in the Erie Canalway Trail that forces trail users onto a busy high-speed roadway. In Central New York, 12 miles of the Old Erie Canal State Park will be upgraded with new surfaces from Chittenango west to Green Lakes State Park. The latter three projects are part of Governor Cuomo’s Empire State Trail initiative to create a 750-mile bicycling and pedestrian trail spanning New York State, from Buffalo to Albany and New York City to Canada. Learn More. A former U.S. Army Reserve facility in Canandaigua will be repurposed to help visitors and tourists better enjoy the acclaimed architecture and gardens of Sonnenberg Gardens and Mansion State Historic Park. Sonnenberg is a late-19th century Victorian Estate with a Queen Anne-style mansion and nine historic themed gardens of the world. The Army Reserve facility and a second adjacent property will provide space to allow Sonnenberg Gardens and Mansion to better welcome visitors with a café, gift shop enhanced program space; create a greener, more visible gateway, and enhance the estate's historic integrity. Learn more. The Harlem River is a prominent feature of Roberto Clemente State Park, located in the Bronx. 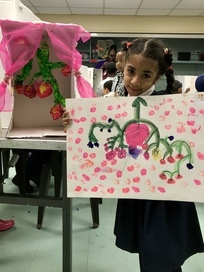 Through a unique partnership supported by the New York State Parks Connect Kids initiative, local kids are learning about the ecosystem of this natural resource through art classes designed and taught by artists from the Bronx Children’s Museum for its Little Friends of the Museum program. Throughout the school year, Museum artists provide classes for twenty-five 2nd and 3rd grade students enrolled at PS 274. The classes are held at Roberto Clemente State Park where students research, design, and create prototypes for future museum exhibits that will be inspired by the natural flora and fauna in and around the Harlem River. Through this program, students gain an understanding of the natural flora and fauna found in the Bronx near the Harlem River and where our water comes from while also developing a sense of responsibility for the natural environment and historic landmarks within the Bronx, and learning how they can live a healthy life by becoming more active and exploring the natural resources. What does someone in your position do? As chief administrator over the Western District state parks, I lead and manage our managers and inspire staff in carrying out the mission of the agency and the Commissioner’s priorities. What’s the coolest thing you’ve ever done? 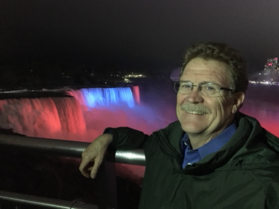 In 2016, I was honored to serve as the chairman of the binational Niagara Falls Illumination Board when we undertook a $4 million upgrade of the lighting of the Falls. We went from old, low quality xenon lights to state of the art LED lights that are not only energy efficient but they provide thousands of color options, movements and a double the amount of light projected through the mist and onto the Falls. Seeing the illuminated Falls is such a special part of a visit here that being a part of that was that really cool. It was also pretty cool to be present at the marriage of Jim and Pam from the TV show “The Office” when they shot their wedding episode at Niagara Falls. Is there a destination in Western New York you’d recommend to someone? Since I oversee three park regions and as any good parent knows, I never have favorites. But if you want energy and to feel the force of nature, you must go to Niagara Falls. If you are seeking peace and serenity, Letchworth is the place and if a vast wilderness is more your speed, there is nowhere better than Allegany. Each park in our system offers something special and different for everyone. What inspired you to work in the park system? My original career out of college was working in parks. I did that for seven years and then left it for 25. When the opportunity to come back to parks presented itself, I saw it as an opportunity to serve a greater, more diverse public. I have always lived by the mantra of “leave it better than you found it” and I believe that I have been blessed to do so because of the people and places I had the privilege of working with. Gift Idea for Dads or Grads! Looking for graduation gifts or the perfect something for Father’s Day? 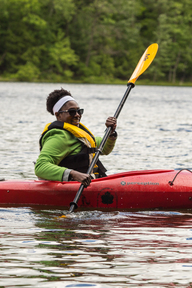 The New York State Parks Gift Card is a great way to say you care for people who love the outdoors. Available online and by phone (please order by June 4 to allow for delivery) or for purchase in person at many state parks and regional offices. Available in any denomination, with no expiration date! Learn more.